I think that many people have this idea that if you’re frugal, it means you’re miserable. That you save every single penny and hold onto it for dear life. In my view, that’s not what frugality looks like at all. Yes, I’m an advocate of never spending more than you need to. Yes, I’m a firm believer in taking time to scout out the best deal. Yes, I’m all about making-do and doing without if you are in a tight spot financially. But despite all of this, I do not believe that you should become a miser or a tightwad in the name of “frugality.” After all, I believe money is just a tool. The purpose of money is not to accumulate as much of it as you can; it’s to do as much good with it as you can. This is not just about giving and making an impact, but also about investing and spending your money in a way that is in line with your family’s priorities. It means deciding to save money in areas that don’t matter to you so that you can spend more money in areas that do matter to you. For the first few years of our marriage, pretty much every extra penny went to paying for making it through undergrad and law school debt-free. We had made a choice: 1) to invest our money into law school and 2) to try to do it debt-free. By making these choices, it meant that other things had to take a back seat: we didn’t buy anything that wasn’t a basic necessity and we made-do over and over again in order to stay out of debt. Choices can have either consequences or rewards. In this case, it turned out to be rewards because those choices put us in a position to eventually have wiggle room in our budget to make other choices — like being able to splurge on some budget areas that are important to us. As our budget has increased, we’ve have lots of conversations over what areas are priorities to us and what really matters to our family long-term. These priorities sometimes change as our seasons of life change — and that’s a good thing! Priorities and needs change over time and so should our budget. This is paramount to everything we do and the driving force behind why we want to manage our money well. Truly, there is so much blessing in being a giver! And the thing we’ve found is that you can’t out-give God. The more we open up our hands and let Him use our resources to impact others, the more fulfillment and joy we receive in return. All of our kids are actively involved in one sport — Kathrynne is on swim team, Kaitlynn takes ice skating lessons and private coaching, and Silas just started baseball. Each of these costs a fair amount of money — from the cost of equipment to the costs involved with competitions and swim meets, to the costs involved with lessons and coaching. For some families, this investment might not seem worth it — especially when you factor in the time investment (Kathrynne has swim practice/meets 3-4 times per week, Kaitlynn has lessons/coaching 3-4 times per week, and Silas has baseball once per week). For our family right now, we feel that this is money and time well invested because of the character we see our children developing. Not only do these activities encourage our children to be more outgoing and brave in new situations with new kids and adults, but it challenges them to work hard, learn to listen and follow the instructions of their teachers and coaches, face their fears head-on, and have a good attitude even when they struggle or don’t place well in a competition. We truly believe that the lessons they are learning from these sports will be invaluable for them the rest of their life. Instead of running from hard things, she’s embracing them as part of the process of perfecting new ice-skating jumps and maneuvers! I fought against the idea of hiring a cleaning lady for a long, long time. It felt so extravagant and just plain wrong for a frugal person like me to spend their money on. But Jesse kept on encouraging me to just consider it. Finally, after much coaxing from him, I broke down and tried it one time. For many people, this might not be a wise investment of their money and I honestly hesitated to even put this out here publicly for awhile because I know that some people might be a little put off by it. But here’s the truth: Jesse and I both work 30-40 hours per week and we are committed to homeschooling our kids, so we’re learning that we have to look for ways to streamline and simplify our lives if we want to have breathing room and margin. Having a cleaning lady come in a few times per month saves us at least 15-20 hours each month. That’s 15-20 hours we get back to invest in our kids, invest in our marriage, and maybe even to spend sleeping or just enjoying downtime! When we divided the cost by the number of hours it saves us, we realized that it was very worth this expense for this season of life. Because we make a good income and because we found a cleaning service with good rates, it really only costs us a few hours of our time working to pay for the cleaning service each month. Right now in my life, I’m all about spending a few hours of time working in order to save 15-20 hours per month! We still have to keep up the daily maintenance — and we all pitch in to help with laundry, pick up, bathrooms, kitchen cleaning, etc., but it’s been incredibly helpful to have someone come in and clean our floors, dust, deep clean the shower/tubs/toilets, and clean our windows. I’ve mentioned this before, but this is probably one of my biggest (and one of the few!) splurges I make on myself. There’s something about a good hair day that just makes the whole day so much better! Having a good hair stylist means that I have mostly good hair days instead of constantly fussing and being frustrated with my hair when I mostly cut it myself. When I started going to get my hair done at a more expensive place about five years ago, I quickly realized what a difference it made. My hair looked much nicer. It was much easier to fix. And it needed very little maintenance from me on a daily basis. In addition, Jesse loves it when I spend time and money on my appearance (he’s the spender in our relationship, remember?! ), so investing some money on my hair every other month is actually a way that I show my husband that what’s important to him is important to me. When we moved to Tennessee, Jesse signed up for a guy’s fitness group at a small locally-owned gym here. Honestly, this has been one of the best things he’s ever done for his health! He’s faithfully gone to the gym at 6 a.m. 3 times each week almost every week since signing up and it’s been so amazing to see the impact it’s made in his life. Not only has he gotten a lot stronger and fitter, he’s had so much more energy and zest for life as a result! I love to see how healthy and strong he’s becoming and how he’s pushing himself and excelling. The accountability and motivation he’s received from going to the gym and being apart of this group for the past 10 months has been life-changing for him! We keep things pretty simple at our house and don’t spend a lot of money on Christmas or birthdays. Instead, we’ve decided to prioritize traveling and giving our children experiences versus things. Since we homeschool and Jesse and I are both self-employed and can work anywhere, this allows us the flexibility to be able to travel regularly. And we all love doing so! We’ve found a lot of ways to travel inexpensively: we look for great deals online and book things when they are at their lowest rates, we almost always use the same airline and hotel chain so that we can rack up points and use these for free tickets and hotel stays, and, as much as is possible, we utilize credit from Swagbucks to cover the costs of some of our travel expenses. While these tricks allow us to spend as little money out of pocket as possible each trip, we still do invest a fair amount of money on travel each year. However, for our family, the memories we make, the things we get to the see, the history and geography we learn together, the experiences we get to share… are all worth the investment. Your turn: What does YOUR family splurge on? Or what do you hope to splurge on when you have the wiggle room someday? Awesome! I am afraid of trying to be frugal, because I feared that we would becomes so frugal, we would never even want to do anything fun or nice! Some frugal people would rather be tortured that to spend some of their hard-earned money. Someday, I’d like to enjoy the money we are trying so hard to save! Coffee. We buy the good stuff. Our favorite is from a local coffee shop in Manhattan, KS: Radina’s. The roast their own beans, so it is so fresh! Aren’t you a coffee drinker, Miss Crystal? You should order some of this stuff, it’s the best! We splurge on things that foster our faith and learning–books; videos; special desserts for important religious celebrations, etc. We see this as a way of promoting a life-long family culture of faith, family, and learning, three of our top values. I love your honesty! Being frugal in all areas of your spending is a season in my opinion and when the hard work and wise choices pay off you then have the ability to choose where you want to spend and give more. We are a few years away from that but I find it encouraging to see you change some aspects of your spending. I have followed your blog for about seven years. We absolutely LOVE Silver Dollar City. It’s about 4 hours from us and we bought 2015 season tickets with some inheritance from my grandma. It was definitely a splurge and I have second guessed our decision a few times (I second guess everything!) but I can’t wait to have some good time with our little family. (My husband recently took a job with a 75% pay cut! So every penny does matter in our family right now. When he was making more, we got SDC season tickets in 2013). 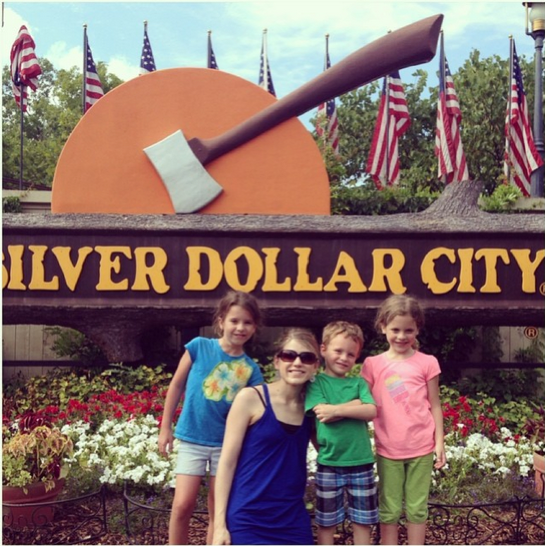 Silver Dollar City season passes pay for themselves after 2 visits. Often, if you can afford it, season passes at various parks and zoos come with special perks and discounts at other places. Zoo season passes can often be used around the country not just in your specific location. Thank you for sharing this list! I love it and appreciate your openness. I consider myself frugal, but am definitely the spender in our relationship. We splurge on some of the same things you do. For example, I splurge on getting my hair done at a nice salon for some of the same reasons you do. Plus, I work in a fairly high-powered/visible career environment, so in my opinion, it’s greatly benefiting my career to streamlime looking put together and polished at all times in my job… and like you said, splurging on certain things definitely streamline your life and make things simpler. Sports is the biggest thing we spend money/time on. My son has been swimming for over 7 years and we love it. I feel like we aren’t just paying for a sport, but for life lessons and hopefully a life long dedication to his health. Plus with 14+ hours of swim practice a week he has really learned some great time management skills. I think that it is awesome that you have someone come help you maintain your home a couple times a month. To me it shows that you are willing to invest so that you can maintain a more balanced lifestyle instead of just being in survival mode. That you live what you preach.You work hard enough, why make it more complicated than it has to be if you can afford it. Also, it’s brave considering the flack you might receive. But maybe you’ll convince someone who needs to do the same thing that hesitates because of what others will think. By the way, I think this post also gets at another important point. We can become a slave to debt, but we can just as easily become a slave to “frugality.” It is just as dangerous to become miserly, stingy, or frugal for its own sake. I learned this lesson when it finally clicked that I was belittling my husband for forgetting to use a .30 coupon. I had damaged the relationship and given money an improper value for the sake of “frugality”. Your message about a healthy attitude about the purpose of money is vital. Thank you so much! I totally agree! There is definitely a balance between being frugal and being stingy. And Crystal, I love how you do this. No, you don’t live as tight as you once did, but you still aren’t just spending money crazily for the sake of living extravagantly. As for the cleaning lady, I think it’s awesome! 🙂 We’ve actually talked about the possibility of doing that down the road depending on how several things work. Like you, I almost fight it because it feels extravagant, but the circumstance that would make us do it are similar to yours and it just feels like it would be so worth it! Completely agree ! My husband made a purchase at the grocery store and I was so upset over it then I realized showing him respect was worth much more than 2 dollars. I have struggled with my health since my son was born 5 years ago and we have seen several doctors to try to get to the root of the issue. I have not been able to find help going the traditional route, so we splurge on seeing a naturopathic doctor and on eating an organic whole foods diet. As a long time frugal person, this has been really hard for me to prioritize spending on. However, as I get pickier about what I eat, I am cooking from scratch more and eating out less, so I think the costs of food overall is staying the same. It is just shifting to eating high quality foods at home. Thanks for sharing you have a cleaning lady come in…it was like a breath of fresh air to me. We also “splurge” by being in Classical Conversations for our homeschooling () Some people work to homeschool for free. We have been blessed so much by Classical Conversations and our community that we would cut out basically everything to afford it if we need to. And, Crystal, I would totally splurge on a cleaning lady if I could! I hope to some day get to that point in life. I love this post, we are also fortunate that we can choose to splurge on a few things while keeping frugal on others. We splurge on family travel and clothes for my husband. I was fortunate to travel a lot as a child and want my kids to have the similar family experiences and learn about the world around them. For my husband’s career, he has a very visible position and good suits/current styles matter. He hates passionately shopping. So twice a year I book him a personal shopper day at the mall. It seems extravagant but it saves time for him because the sizes are all gathered, it eliminates him figuring out what looks right together and I am not doing all the work and hearing him grumble through the stores. I am a bargain shopper since my teens and a personal shopper seemed so unnecessary, I can always find what I’m looking for with enough effort. But for him it is perfect. The kids and I will stick with our stacked coupon codes, consignment treasures and other bargains – that still look great! But for him and his schedule the time savings alone make this splurge worth it. I totally agree with everything you said about the cleaning service! I started a part time job last Fall, after being at home full time for 5+ years. Getting a cleaning service 2x per month has taken such a huge load off of me!! Finding the hours to clean, and using my free time (or our family time!) to clean the house, was such a stress on us. It is TOTALLY worth it to use a small portion of my monthly part-time job income to pay for the cleaning. It is just such a relief to have a totally clean house twice a month! I absolutely love “The purpose of money is not to accumulate as much of it as you can; it’s to do as much good with it as you can.” This is such a great lesson for everyone, old and young!! We splurge on a cleaning lady, too. It has truly blessed our marriage (no angst-filled evenings trying to clean one room a day) as we get to spend more time together and not get caught up so much in these chores. It was liberating for me! I love this post, and yes, I always view my thriftiness and saving strategies as a way to save more so that we can do or have the nice occasional outing or splurge. This was a brave post to write, especially about hiring a cleaning lady. Thank you for saying it. We budget so that I can have a monthly massage, so that my husband can spend a little on his hobbies, and we recently bought a one year family pass to the state aquarium. We live in a rural area with few family friendly attractions, so the investment in the family pass was well worth it. Another thought about the cleaning lady: providing another person with a job is a form of doing good. 🙂 And a job in a nice situation (nice boss, some flexibility, etc) is even better! Thank you for sharing, your honesty is so refreshing! Our biggest splurge is our vacations! We LOVE to travel so it’s worth it to us. We also splurge a little on our groceries to eat higher quality foods. I’ve made it quite clear to my husband that if/when we have children and we’re both working full time, we will absolutely hire someone to clean our home… now only if we could splurge for a chef too 😉 LOL. “Amen!” to the cleaning lady! After our son was born, my husband encouraged me to hire a cleaning lady for about eight months. It was worth every penny! We splurge on traveling as a family too even if we try to travel in a Frugal way! I splurge on my hair. But I would love to splurge on a cleaning service!!! My husband and I work opposite shifts and keeping the house clean gets put on the back burner to kids, work, day to day things. I’m in Nashville. Do you mind me asking what service you use? I wholeheartedly agree with all of your splurges, your definition of frugality and using money as a tool. Balance is key. My current splurge is good olive oil. My husband and I go to a specialty olive oil shop. It is not cheap, so we buy only when they have specials like buy three bottles, get one free. Even then, we look for what’s on sale too. It has made a world of difference with cooking. I like this blog post! My husband is a teacher and we’re a one-income family, so there isn’t much extra coming in, but we do occasionally splurge on travel (nothing too huge though) and I had a cleaning lady for two hours every couple weeks until she had to stop because of her pregnancy. I miss that! We just hired a wonderful cleaning lady when we recently moved and I *love* her – it’s like Christmas morning every two weeks when she comes! 🙂 Like you I fought hard against it, but it’s given me Sundays – my one day off from blogging – to really enjoy my family and just have some downtime. Thank you so much for being genuine and sharing what things have worked for your family! Love this post! Our income has drastically increased in the past few years and I still love your blog because it encourages me to remain frugal…for the right reasons! We prioritize giving (much of this is spontaneous-meet big needs now), getting away as a family, and healthy food (especially now that I’m on THM). I have had a weekly cleaning lady in the past, but have cut her back to once every other month or so to help me catch up. I am not ashamed of how we spend our hard earned money, or the things we make do with, buying clothes used etc… Many people may judge, but they also don’t know what all you are doing with your money. My husband is very responsible and fully funded one of our Roth IRA’s for 2015 in the first week of the year!! Being a single mom, I don’t consider myself to have splurges of any sort, but the few things I do spend money on are Netflix, Hulu, and XM Radio. I also take my kids out to eat at least once a week, if their is money left in the budget. My husband is a spender and I am not. He abhors the idea of a budget. His idea of a budget is: tithe, pay all the bills, add money to savings, spend what’s left how we want. This is so discouraging to me. Spending stresses me out because I never truly grasp what is “leftover” to work with. If I felt like I could splurge, I would splurge on: 1) additional ministry 2) an activity for my daughter 3) hair and good quality make up, a new piece of clothing here and there. BUT- I end up spending nothing instead because it stresses me to do so. Wish we could find a balance! Oh! And good for you for hiring a cleaning lady! I cleaned for two years for additional income. I was able to bring my daughter. It really blessed my family to have extra income and not have to pay for childcare. I have a totally different perspective on cleaning services now! I totally agree with you, Crystal. . . You can’t out-give God! We give to different ministries & as we see a need right in front of us. We also spend a lot of money for our children’s sports & music lessons, & for family travel. My husband may wish I splurged on my hair :). Thank-you for your honesty! Being frugal doesn’t mean living miserably. It’s using our resources on what’s important to us & our family & bringing these things before the Lord. We splurge on everything else listed, except a cleaning service. I find cleaning therapeutic, so hiring that out has never appealed to me. I’d much rather hire a landscaping service! Our other splurge is my husband’s beer brewing hobby. He enjoys inviting some friends over and having guy time while they brew a batch. It’s the one thing he loves to do that is not related to his work at all. Thank you for adding the cleaning lady!!! I work 40 per week and the biggest treat I give myself is my cleaning lady. I take a lot of grief from my friends for it but it makes my life and my family’s life so much easier!! It would take me 8 hours to do what she does in 4 hours. And it only takes me 2 hours of work to pay for it. Leaves my entire weekend free to spend with my family. my husband and I splurge on quarterly massages. (We buy gift certificates when the therapist runs holiday specials!). It has been completely worth it to us, and in its place we gave up all dining out. There was a time in our lives when adding coffee (to brew at home) to our grocery budget was our big splurge. Different seasons and different lifestyles have different priorities, and we re-evaluate ours regularly to ensure we are meeting our goals and still enjoying life! College funds. We have 529 accounts for each child. Swimming lessons. $40 per kid for six weeks. At three kids, it adds up but they’re learning a lifelong valuable skill and getting great exercise. Shoes. I have a lot of foot problems so I buy high-quality shoes with good arch support. I can’t wear heels or flip flops per my podiatrist. Someone to mow the lawn – for the same reason as the cleaning lady! Totally worth the extra time we get with my husband! I have been trying to convince my husband we need a cleaning service! But, he still has not agreed. It is a lot of work to keep up- glad you hire someone! We splurge on travel and good food! We now splurge on going out to eat. We love to go to the local Italian restaurant every Friday night!! It used to be that every penny was tight, but now that it’s not, I look forward to dinner out every weekend. I’d love to get a cleaning lady, just haven’t looked into one yet. I agree…. it’s worth every cent! This is great, thanks for sharing! I too often fall in the ‘miserable-frugal’ pity-party and almost fall slave to money and not having/spending it! It’s definitely good to have a balance, and I believe God made us with unique personalities and we all have things that spending a little extra $$ on can make us happier or more organized/etc. This was a great reminder for me!! 1. One nicer car. My husband drives an older model SUV that gets the job done – gets him back and forth to work. We plan to continue to run it into the ground, then buy another inexpensive vehicle (probably a pick up truck next time) when the time comes. To balance this out, we “splurge” on a nicer vehicle for me to drive the children around in and to travel as a family in. This “splurge” is still a four year old vehicle that we will also drive until it has very little value. We save cash in an envelope on a monthly basis to be able to replace these vehicles when the time comes with cash. Amen to #1. We don’t give solely for this reason, but we have found that when we give over and above our usual tithe, often God provides extra overtime or an unexpected bonus check or something along those lines. We love to see Him provide over and over and over again! I love this! I worked as a personal assistant to a lady whose husband is a national speaker and one of the things I did was clean. It was so neat how by delegating those type tasks she had more time to invest in her children, marriage, ministry and others. I loved seeing how intentional she was with the time she saved by me doing some cooking, cleaning and laundry. It was a wise investment in the health of everyone! And now I’m married with 2 kids and one on the way and one of the splurges we do on a tight income is my hair, my husband thinks its so attractive and loves when I get it done and of course I do too! 🙂 and another is save up money & be intentional with coupons to go on a couple weekend getaways, which are life givers for our marriage especially when we are about to have 3 kids 2.5 and under. As a single mom every penny counts. We love to eat out. We do the kids eat free nights and try to spend under $10 for the 3 of us. So we eat out once a week. My girls dance so that is about another $2500/yr. Private art lessons for DD#1 who is very talented. You can not put a price on those things. We love to travel and like to go to Disney every other year. I do not have a large savings acct and never will,but we are happy and love being together so that is what works for us. We have a gym membership and while I do use it about three times a week, there are many other benefits. Free child care! I can put my youngest in there for up to two hours each day. On the days he doesn’t have preschool we go whether I am working out or not – if I’m not working out I will read or bring a notebook to write in or jot down ideas. They have preschool type activities for his age and he loves it so it is a win-win. Our club also has free karate for kids and adults, and a huge indoor rock wall with lots of free sessions. I think if you can find a family style gym like this it is a great place to spend a little extra. Good shoes is one item I splurge on. I find they make all the difference to my energy level at the end of the day. Weird sounding I know but good support really does make for less tired feet and when my feet don’t ache my energy lasts longer. Crystal!! I just asked Will if he saw this, and he had already read it! I love how real you are. I admit that I’ve been really, really feeling guilty about #3. I had a post idea in my head about how I DON’T do it all (because I’ve had some people recently tell me it looks like I do), and I have been really scared how people might react if I were to admit #3! We splurge on three of the same things. We splurge on charitable giving. We feel like it is so important that we give back a portion of what God has given us. 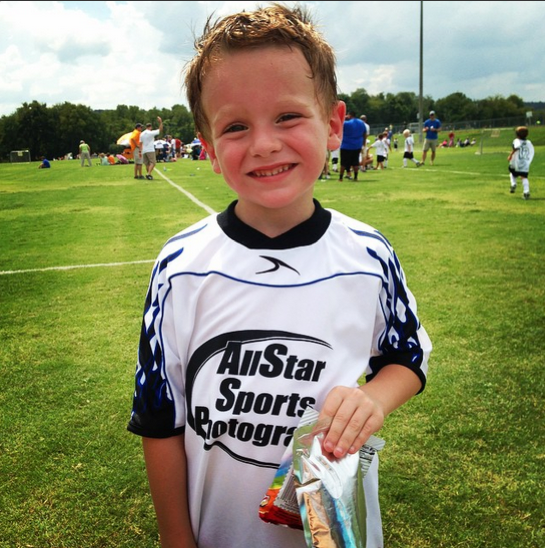 Our son plays three sports. There is a bit of overlap on both sides of baseball, but it’s not too bad. We also only have one child, so the commitment isn’t nearly as much as it would be with multiple children, trying to coordinate schedules. We also spend a lot of money traveling. My husband works a lot of long shifts, with deployments thrown in, too. Plus he’s a volunteer EMT and firefighter. Vacation time is important for our family. I do look for ways to save money on vacation, but we just save carefully for the vacation so we can travel peacefully without stressing about money. We don’t splurge the other ways you guys do. My family has free access to the gym on base or we probably would pay for a gym membership. I am a licensed cosmetologist, or we probably would spend more money on hair. I don’t think we will ever have a cleaning lady, though. I don’t like having strangers in my home, and my dogs certainly don’t like it. So I think for the foreseeable future that is something we will take care of ourselves. But I think it’s awesome that it works for you guys! Other things we splurge on include food and things to help us sleep better. We eat as much organic food as we can find. We don’t eat artificial colors or sweeteners (I have a pretty severe reaction to red dye in particular). I cook from scratch more often than not, so our budget there isn’t totally out of control, but we don’t sweat it that we have raised it considerably over the last two years. We consider our bed and pillows an investment in our health. It’s amazing the difference it makes when you sleep on a bed that is right for you. Same thing with pillows. I love this article because I believe this way too. We are frugal so we can spend money for things we consider important in our lives. Just like you we love to travel and give. Living in a cold snowy Michigan cable t.v. is important to us too! My big splurge is on my children. I would prefer to go with out so my kids have what they need. We recently decided to make some major cut backs in our spending so money is very limited. I work 40 hrs a week, my husband works 60 hrs a week (20 hrs is an extra pt job to help pay for daycare) and we still are scraping to get by. I’ve started to really get into couponing, sale items, buying generic items (not all, some generic taste like crap or don’t work as well as name brand), and really seeing what we could go with out. I go through my children’s clothing and when it is outgrown I try to sell it to make a few extra bucks to buy new clothes for my kids or other stuff that they need. Very rarely do I spend on myself. I’d rather buy for my children or my husband. Make sure they have what the need/want. I also like to be able to give back through out the year. Whether it is for a local family who is in need or at Christmas we donate to the local food pantry. We splurge on things now that money isn’t so tight. I still cook from scratch, coupon, and diy most things. Now that we can I buy a ton more fresh fruits and vegetables. We have four daughters and they are very active in activities and even when games are 2-3 hours away we go. It’s a big expense for gas but that was one thing we chose to never cut out. I always took my “ballgame” bag full of snacks, juice, water. I still take it with us cause I’ve found that some of my daughters friends don’t have money for snacks at games so they know I have a bag full. Although now we do buy popcorn!! Thank you so much for this post!! My husband and I definitely have things we consciously splurge on (like going out to dinner together). But we are able to do so within our budget. My friends are sometimes surprised when we go to a nice dinner – but then I say no to going to a girls brunch. I see date nights with my husband as an investment in our marriage!! We choose how to spend out our blessings. And that is one of the most freeing things. I’m with you on the cleaning lady. One of my goals for the year was to significantly lower our monthy spending. While I could accomplish that goal much easier if I stopped our cleaning service I decided that the benefit I receive from not having to worry about a clean house far outweighs any cost savings that I would receive. We splurge on a cleaning lady to come in once a month. It’s so worth it. Also, we splurge on travelling to visit family a few times a year (some closer, other far). I wouldn’t call giving splurging and I wouldn’t say that everyone is overdoing frugality – some have no other choice but to be frugal to live. We splurge on internet, as it is a luxury – millions of Americans can’t afford it. Special foods would be a splurge – ice cream, eating out, etc. I definitely agree with not calling giving splurging, but I think that maybe Crystal just meant that it’s something they spend a lot of money on? Maybe splurging just wasn’t the best choice of words there. Definitely a good point. I just felt it deserved to be on this list because it’s a priority for us and where we are investing a lot of our “wiggle room” money right now. I was thinking of the definition of splurge, which means to me something wasteful or extravagant – I guess it could mean other things after looking up the definition. I just didn’t see giving as wasteful but something good. I do understand where you are coming from. I didn’t intend that personally or anything – just that I assumed splurge = wasteful spending. 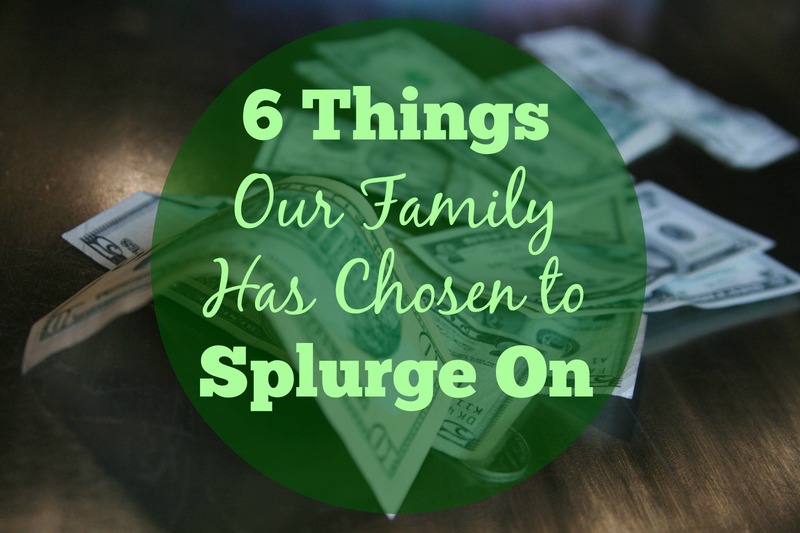 For us, “splurge” means intentionally choosing to spend money on something that isn’t a necessity but that accomplishes something of value for our family. I tried to quantify how we decided to “splurge” in each of these categories to show that, for us, it wasn’t a wasteful expenditure, but something that brings value to our home/life/family. There are different definitions of the word, for sure, but that’s how we view it. I hope that helps to clarify! And thanks so much for saying something as I’m sure you weren’t the only person who felt that way! We run a non-profit in India. I have been told by people who say they cannot budget in for a “luxury” like extra giving or tithing. When the recession hit in 2008, we (and many ministries) took the first hit. Many people would say they cannot afford anything but the basics. Then we have one of our child sponsors who budgets money to get her nails done, she decided to redirect that money to sponsor a child. So her splurge fund became the giving. It is really people’s mind set, but many do see giving as splurging. My frugal daughter – who is working as a “cleaning lady” to help pay her way through college – greatly appreciates such “splurges”! So what are the 6 things which are your most frugal? I actually have that article all drafted up… only I’m having trouble choosing just 6 things! 🙂 I’m hoping to post it in the next week or so. Thank you for sharing about your cleaning lady! My husband and I both work 40 hours a week. We are expecting our first child and I have an hour commute each way to work. I always feel judged when people find out we pay someone to come twice a month. We are pretty frugal and make sacrifices to afford this luxury so that we don’t spend our Saturday’s cleaning and can choose to do other things together but people don’t seem to understand that. Regardless of judgement I am not giving her up, she is such a lifesaver! The first advice I always tell a new working mom- GET A CLEANING LADY! It just seems like in life, I can either have time or money, but I can’t seem to have both. An hour someone else cleans my kitchen is an hour I could spend with my baby. Only speaking for myself here…but often (not always for sure) when I feel judgmental toward someone about something i’m actually jealous. Other times I’m just genuinely not seeing the big picture. Either way, when I feel judgmental, that’s 100% on me. Not the other person. I agree with #1. We also prioritize giving even more than the average tithe. It’s amazing seeing lives transformed. What a blessing as a family to be a part of what God is doing in others’ lives. We splurge on good/healthy food and in abundance so we can host friends, family and our small group regularly. We also splurge on a golf membership at a nice course for the whole family. It’s something we all enjoy and we get our exercise and while enjoying beautiful summer weather. I love this article! We “splurge” by traveling too – we usually camp to help keep it affordable for us. I’m considering a meal service that I saw on thenester.com this week since I’m working full time at my husband’s office for a season. I’d love to have healthy meals that I don’t have to think much about! Also, I love that you have a cleaning lady! Such a great investment for you family. We increased our food budget, not just to accommodate growing appetites, but to also allow more wiggle room in our grocery shopping. I spend money on books for our kids, even if they are used, I will buy quite a few in addition to using the library. we have discussed cleaning help, but right now I think I have just given up on deep cleaning . We do give a large portion of our income and I love it. Love this post Crystal. Vacations are definitely where I like to spend my money. Some of my friends get a kick out of the fact that I refuse to pay for things like toothpaste and deodorant, but will happily spend on traveling with my family, but to me that is the point. I like knowing how to save daily so that I can spend our money on what is important to us. Love this!!! I never considered giving a splurge, but I guess it would look that way to an outsider…..we give a lot as well. When I saw the numbers on our taxes, it really made me pause to think of how other people might be able to spend that money…..but of course it is the choice we believe to be best for us, and God has blessed us richly with far beyond what we need for a comfortable life! Other splurges are occasional “fine dining” dates (we love fancy food! ), special bed and breakfast overnights, travel, and other “experience” type things as a family (day trips, etc). We figure we’d rather forego nice clothes, new cars, bigger house, more “toys”, etc for the experiences that will shape our marriage/family memories. I currently splurge by getting a massage a couple times a year. It’s so relaxing! We definitely splurge in some areas. We are very careful what food and drinks we purchase. I have some allergens, but we have also realized that whatever we spend on food we don’t spend on medical care. We both work in health care, so we see the direction things are headed for many people and we try to stay healthy in the realms we can control. I also splurge on local farm goods instead of the grocery store. It costs more, and we spend more gas, but I love it. We also splurge on gas and travel…our friends are farflung, so to keep those relatonships requires commitment, so we travel! To keep our splurges around we rent, have basic wardrobes, make our own cleaning and beauty supplies, and we only have one quite old vehicle. But it is all worth it! To kind of repeat what someone said earlier about the cleaning lady- your splurge at your local farm allows people in a very difficult career to then be able to splurge. Today I splurged by ordering pizza (sick baby that needed cuddles more than mommy to go grocery shopping). I’m hoping the tip I paid allows someone else to splurge- or make ends meet. I totally agree Beth. And my splurges aren’t everyone else’s, and that is totall cool. Diversity makes the world so much more interesting! Wow!! I could have written this post!! That’s where we splurge too….except the cleaning lady….although I would love that!! We have a cleaning lady too. Both of us work and we have 3 under 4. Cleaning lady day is my favorite day every two weeks. My husband says when we make it big she is coming every week. Our family splurges on travel. We love cruises, Orlando theme parks, camping, and visiting family in Tennessee and California. We save up for trips (there’s a Dave Ramsey envelope for that!) and we get great deals on them (gotta get the most for our money! ), but we definitely feel it’s worth it to make vacation memories together. We choose to spend our money on healthy, high-quality, nutrient-dense, organic foods. Natural, healthy eating isn’t always as cheap as eating conventional foods (though we manage it on a budget), but we think it’s very much worth the additional expense. I completely agree with your splurges and they are almost right in line with ours! One that I’ll add that is important to us is a Catholic education for our children. I will pinch to the very last penny before I have to remove my children from a Catholic school that we all dearly love. It is so important to our family to have our faith instilled in our children on a daily basis and I would give us so much before I ever had to give this up! We spend more than we used to on organic whole foods. We fully believe in food as our medicine and want to stay toxin free and as healthy as possible. This was a difficult decision with five kids and one humble income. And by humble, I mean it! But for us we go without other things such as cable/satellite, a good car, restaurants, and lots of stuff. I like your splurgeds, unfortunately a housekeeper isn’t in the budget….oh well my lunch was good. Lol. You rock Crystal! Our priorities are Catholic education and sports. Private school has a lot of unexpected expenses but our daughter has made life-long friends ( as I did many years before at the same school). Sports provides a lot of life lessons and teamwork. It also teaches our daughter how to balance schoolwork, service to others and extra curricular activities. Lastly, as a family, we try to use our extra money to make memories rather than collect things. I know that school and sports are actually temporary things as our daughter gets older so I’m enjoying the fact that we can make these financial decisions without guilt. We splurge on a gym membership. We pay WAY more than most people would find reasonable to be a member of an awesome gym – it has indoor/outdoor pools, a “spa room” for relaxation, amazing childcare, and is just generally a wonderful place. My husband and I are both into fitness, and we use the membership almost every day. It is well worth it, but definitely still a splurge. We also “splurge” on babysitting for date nights. We’ve been doing at LEAST 1x per month date nights since my second was born (it used to be one time a week, but we don’t have as reliable of a childcare situation since we moved). This is clearly an expense that could be cut, but it makes a huge difference in our marriage and our stress levels. It is nice to go out and feel like a couple again! I love how honest you are with your readers. The hard work and faithfulness in your life shows how with wise choices and following God’s teachings lead to many blessings. I am also in the position to splurge and have a hard time setting priorities. I think I might enjoy updating my kitchen, new carpet, or investing in my hair, or skin. I do have fears that if I do not keep a firm grip on finances that I might need the monies for a later time. Prayers for guidance in this matter would be helpful. I am very much like you with those fears but I took the fear out of how we spend our money by setting up a budget and all of the things you mentioned are in our budget. Prayers coming your way. Yes to #1!!! The more we give the more blessed we are! One place we splurge is our vacation house that we own in partnership. In reality we could not go anywhere for one week for what the house costs us for 4 weeks every year. Plus we can use it any other time that it is not reserved by one of the partners. It is where we go to unplug and rest and renew our relationship as husband and wife. Another splurge is live music. We set aside an amount of money each year for concerts. We have also found that we can volunteer at some of our favorite venues and see the concert free but sometimes it takes gas expenses and a half day of hubby’s vacation to make those happen. The other is eating out. After raising 5 children and feeding them three meals a day and eating out only a few times a year it is a wonderful thing for me to not have to cook and just sit and enjoy my husband’s company. We also have a budget for taking our adult children and grandchildren out when they visit. That budget is also used for taking friends out when we feel that they need a treat and some face time. I love reading more personal posts like this. Investing in a cleaning lady pays off with extra hours that you can devote to your family. We also don’t do big birthdays and presents and invest in travel instead. Hope you don’t get any backlash. Whenever one is happy and/or lives well, there will be envious people trying to bring them down. Keep doing what you do. I totally agree and only came to comment for the same reason. I’m not sure why people go out of their way to be hurtful, but I am so glad to see people go out of their way to be kind. Great comment! Great article! We splurge on organic meats, buying good DVDs which our kids will want to watch over and over (& that we can take on road trips), and giving to those in need. I think I need to splurge on my hair because Crystal you made a very good point about how it saves you time. Thanks for sharing that you have a cleaning lady! I often read your blog and have felt guilty that you and Jesse work so much, homeschool, AND keep the house THAT clean! My husband works 45-50 hours a week and I work 40 I review books and we both volunteer at church and my house looks AWFUL. But I’ve got chronic pain too so I just let it go. Right now I can’t afford to pay someone but I feel better knowing that you don’t do it all by yourself either!!!!!!!!!! We splurge on travel — for the third year in a row, we are taking our kids overseas. It is important to my husband that our kids see the world so we are frugal in other areas to make this happen. We also splurge on Catholic school tuition for our two high schoolers and one middle schooler — it is important to our family that our kids are educated in this manner. And last, we have a yard guy who mulches, mows, trim & helps maintain my garden beds — I like to garden but my yard is fairly big — too big for just me to maintain. Summers here are very muggy (Missouri) and no one wants to mow when it’s 100 outside. When you say Yes to something, you have to say No to something else. When you devote yourself to intentional living, some things gotta go….like cleaning the house! haha Thanks for sharing, i love your blog. Oh a cleaning crew…I can dream! Lol. The day we can I’m so calling. But I am hoping we will be able to hire a teen mommys helper, at least for the summer. With our 4th baby due soon, and a busy summer planned, I think it will be a good investment on my sanity. A mother’s helper was the BEST THING EVER when I had three young children! I liked this post because it’s showing the other side of being a good money-manager. We are pretty careful in most areas, but my daughter (I only have one) is getting married, and her wedding is an area that we will be “splurging” on. We could definitely do it cheaper than we are, but we have taken time to weigh out the benefits of going with a strictly frugal mentality verses making this an extravagant loving gesture for my daughter as she leaves our home. As a Christian, I believe that God gives us many beautiful things. He values marriage and we want to have that same mindset for our daughter and future son-in-law. I’m thankful for a husband that is supportive of being a bit extravagant in this way! It made me kind of sad that you were a little nervous about putting the cleaning lady on there! I know this is a public blog but that’s definitely your decision. And anything that gives you the chance to be with your kiddos more is worth it! As for your hair, it is definitely God-honoring for you to honor something that is valuable to your husband….and for men, appearance is a big deal. I really love how much you do for your family! I think it is interesting to see what others like to spend money on. We will spend extra money on big ticket items that will last longer than their less expensive counterparts. We will invest in higher quality parts when we repair our cars, to help them last longer. We will also spend more for organic compost for our garden and better fertilizer that’s organic if needed. We also will spend more for plants for our garden to get a compact variety. We spend money on our airplane. My husband loves to fly and it’s a big stress release for him to go out and jump in the airplane for a flight on the weekends. Before you think this purchase isn’t too frugal, we purchased the airplane for half as much as the average new car cost and it costs us less than our cars do to maintain, insure and fuel each year. Our kids love hanging out at the airport too, so it’s fun for the whole family. There are other things we give up to be able to do these things, but that’s what life is all about, having a balance and enjoying what’s important to you. Thank you so much for pointing out the broader benefits of children’s activities. I have been feeling guilty for splurging on weekly swimming lessons when other areas of our budget are so tight. You make excellent points about character development, it’s more than just going swimming. I too agree on giving as a form of splurging. When I have extra room in my budget, I give more to charities locally, and to online loaning through Kiva.org. This past month, I was able to donate over $4,000.00 from my couponed stockpile to local charities, and the tax receipt I received covered my expenses in terms of ink, gas, and time to scout deals, which can be passed on to others. It also goes without saying that a lot of people will read your article, and not see how much work goes into receiving the income that you may have. Personally, I often find myself tethered to my home office some days for nearly 16 hours at a stretch; I work-from-home in the legal field, blog, and run two at-home businesses. When I do splurge, I feel it’s compensation for the time I spend behind a screen daily, working on helping to provide for my family and fund my retirement savings. I feel I am worth my hair appointments, my handbags, and my family vacations. Frankly, we should all splurge on ourselves, from time to time, as a reward for the toil we complete daily, after all we exchanged great, vast, precious sums of our lives in exchange for those funds! With that said, I’d love to a six-part list on items you will never splurge on! We splurge on organic and healthy foods, the kids, and nice name brand jeans. Hey, if I wear them two days a week for three years, it’s okay;0) It’s all about choices and trade-offs. We splurge in areas that are important to us! I’m trying hard to get to the point of a cleaning lady. My hubby is normally the one who does the cleaning (we both work full time outside the home and he is WAY more picky about it…after a couple of years with him following behind redoing my work, I handed it over!). However, he now travels a couple of weeks out of the month and it stinks for any of us having to waste the little time we have together on chores. Oh sister, I’m so happy that you have cleaning help. 🙂 That is first thing on my list when the budget allows. I, too, spend more on my hair. I have a day job in the news business and need to look somewhat pulled together. Thank you for this post. It’s awesome to see how God has blessed your family. Every couple of months we splurge on a landscaper. I love to see my kids play in a well maintained backyard. I wanted to say THANK YOU for hiring a cleaning lady. You see, my daughter and I clean houses. It’s a way for me to have a little spending money to call my own and for my daughter to pay her bills/have spending money. So, you’re helping someone else, as well, and that’s a BLESSING! I splurge on really good (read: expensive!) makeup and skin care. It’s really not so much a choice, though- my skin is insanely sensitive to most chemicals, dyes, perfumes, etc. Fortunately, the gang at my local Sephora is super about giving me samples before I buy to see if the product will cause welts. We also splurge a little on used books, usually buying from Better World Books. Our library system is very poor and reading is a priority in our family. And it is my goal to pay off this one particular debt so I can afford to have a cleaning lady come in twice a month for my mom. One thing we choose to splurge on is education. We have four children and we chose to live in expensive Connecticut close to family. We found the school systems to be stellar and although we pay very high taxes, we feel the quality can’t be beat. To be able to pay astronomical taxes, we have no cable, drive older cars, never buy new clothes, and never eat out. Ironically, we used to have a cleaning lady but I found it stressful because I really had to clean alot before she came and I was always yelling at everyone to clean for her. When my husband lost his job, it wasn’t too hard to give up. LOL. Hey there’s a free Kindle version of the American Frugal Housewife on amazon right now! 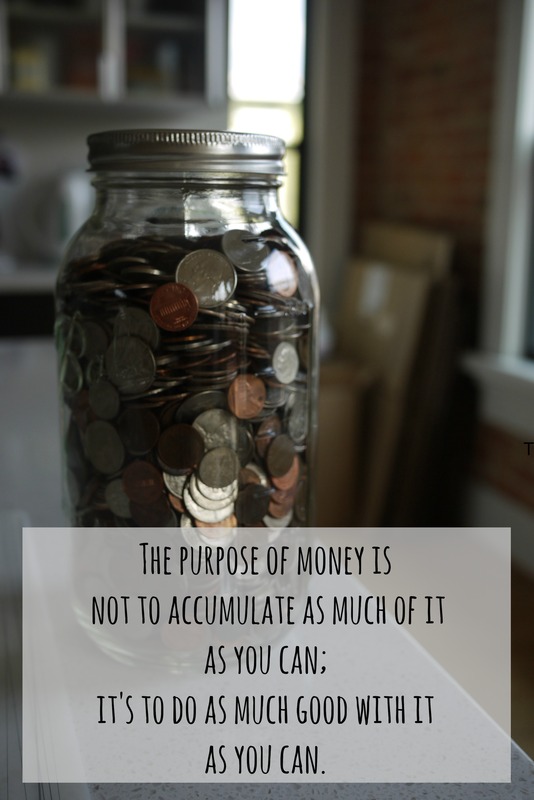 I love how you said, “The purpose of money is not to accumulate as much of it as you can; it’s to do as much good with it as you can.” So so true. With two children in college and only one home full time in high school. My husband and I have always invested in our children. I have had the luxury of staying home and home schooling our children in their early years and then later we sent them to a private Christian school. We have also invested in memory making through many family vacations. One of our splurges is when we travel International we are a bit picky on our airlines. We travel frequently to our ministry in India. There are budget airlines that are not as good. We will spend 200 more per person for a better airline. It is so much better especially when we travel with our small kids. We are even looking into doing some stop overs it may cost us a few hundreds, but we are going plan travel through places like Dubai and Singapore. The cultural experience for the kids (and us) will be awesome. My husband has just convinced me to spend more money on a good hair cut and dye. I have fried my hair but doing it myself, so it is worth it. Those are a few of our splurges. What airlines do you prefer? I also travel frequently between the US and India (with my husband and kids) so I would love any advice you have on making the long journey as do-able as possible. I should get a cleaning lady as there is more to life than cleaning all the time. I have big children now and they are very messy! Hair… must persuade my husband to let me go back to my old hairdresser. He says they are too expensive but they were brilliant. What an interesting window – thanks for sharing! My husband and I are working to pay down a lot of debt, but we prioritize ballet class and summer camp for our daughter. She’s an only child and pretty introverted, so socialization – especially over the summer – is very important for her. Luckily, we just found out that we’re getting a tax refund, which will cover both for a year! My splurges are quite similar to Crystal’s, with the exception of the cleaning lady. Instead we pay for lawncare, so that my husband doesn’t have to spend his precious non-working hours working on the lawn in the Houston heat! Although my husband has said he’s ok if we get help for cleaning, I haven’t yet bit that bullet yet. I do enjoy occasional splurges on going to a paint your own canvas night as a mom’s night out for myself….helps keep me sane (and I usually wait until I can find a groupon for it, too!). I love this list Crystal! We do almost all these, except the cleaning lady. But now that my kids are getting older, they help out in this area. Its awesome! The area we “splurge” on the most is definitely food. High-quality food is worth more to me than high-quality clothes, appliances, or anything else really. Our food budget is higher than most, but I would bet our eating-out budget is much lower than most, too. Plus, our overall health this past year has been incredible, without anyone getting sick, and I attribute it to us keeping our bodies healthy. I really love this post! I’ve just made the decision to invest in a full diet CSA that provides vegetables, eggs, meat, and grains straight from the farm. This is going to involve a fair amount of cash, and i’ve been feeling guilty about it because how hard I’ve had frugal living drilled into me (as a kid) and then drilled it into myself (as an adult). But eating this way and challenging myself to only eat this way (this will take up all of my grocery budget) is worth it to me and it’s good to be reminded to spend on those things. Thanks for sharing! Great choices! I splurge on essential oils every month, but they replace a lot of things I used to buy. We also splurge for a gym membership for my husband, but he doesn’t go as faithfully as yours does! I really wish he did. Having a hard time justifying the cost since he falls out of habit with it so much. Love this post. When we were homeschooling with little ones, I could not afford a cleaning lady, BUT I could afford to hire teenage girls in the neighborhood to help me with my laundry mountains. Never regretted it! Great post, Crystal! I actually have a similarities in my list to yours. I splurge on good haircuts for myself (I have crazy hair), “clean” meat and produce, good vacations for our family, and sports for our kids, and giving to our favorite ministries. We also homeschool, so we’ve made a monthly “homeschool needs” budget this year, and it’s been so freeing to go ahead and buy another book, art supplies, etc, because the money is already there! I am actually considering a cleaning service because I have 5 kids ages 19 mo. – 8 years, and with homeschooling, I am getting kind of desperate about the state of my house! Ha! My older boys are very helpful, but it’s still so hard to hit the whole house with a good cleaning. Thanks for sharing! I know this is almost 2 years old, but I really hope you decided to get some cleaning help! 5 kiddos – it’s worth every penny!! Good for you! It’s exciting to see your hard work pay off so that you can now enjoy these things. I too splurge on my hair and travel. You’re right, a good hair cut makes all the difference! I do all of these but I don’t like thinking of them as a splurge. To me the word splurge implies something you shouldn’t do but are doing anyway. If it fits within someone’s budget, it’s not a splurge, it’s an investment that has been budgeted. One area for which we have allocated a larger budget than many is food. We can afford to buy more fresh produce and higher quality items so we do. It hasn’t always been that way but it’s a change I’ve been happy to make. I think it’s awesome that you hired a cleaning lady! I used to clean homes before getting married and was very grateful for the income. 🙂 And it’s jsut plain comforting to know you don’t do it all! High quality larger purchases: we don’t make big purchases often, but when we do, we research a lot and then choose good quality, even if it means a higher price tag. Healthy food/ quality supplements: thanks to Aldi, our grocery budget is pretty low, but we do splurge on non-homogenized milk, good beef, whole grains, etc. I also choose good quality herbs/supplements, because the difference in quality seems worthwhile. Family outings: my husband works a lot. As the frugal person in the family, I used to stress out when he wanted to take the family on a fun outing. Now I see it as a way for him to bless us with all the hard work he does. I don’t mean for this to be negative so I hope it does not come out that way. I just recently found your blog and have spent time reading through older posts (which I really like). I congratulate you on how hard you and your family have worked to get where you are and the sacrifices you have made. You made some very wise decisions from a very young age that many take years to learn. Of course I only know a part of story…what is on your blog. It seems to me that there could be more acknowledgement in your post like this one about readers, purchasers of your books and attendees of your speaking engagements. They are a large part of why December212012 is so successful. Without those devoted followers you would not be where you are today. Yes you made very wise decisions, but you also stumbled upon something that is very lucrative. Anything with the internet can be here today and gone tomorrow. Its not like medicine where you always going to have sick and/or hurt people and need physicians. Again from what I have read you are an amazing person, parent and wife who is extremely smart. I am not writing this to get posted just to hopeful give you some feedback. If you are not already doing it, I would encourage you to reach out and speak to young adults. As you know, decisions you made in those very early years can impact you for a long time. I hope you a have good weekend! Welcome! And you are absolutely right that I am forever indebted to my readers. As I often say (but it cannot be said too often), without my wonderful readers, there would be no blog. I LOVE this community here and am eternally grateful for all that everyone means to me and how you all have impacted my life. One of my very favorite things in all the world is to get to meet readers face-to-face so that I can personally tell them thank you for how they have been such a support, a cheerleader, and an encouragement! So thank YOU for being a new reader here. I’m so grateful to have you joining us in this journey! In my opinion, Crystal has done an AMAZING job showing how thankful she is to all of us who follow her blog and purchase her books 🙂 I’ve seen much more about her gratefulness on this blog and emails than on any other site. I don’t mean to be argumentative, but I think it’s obvious she isn’t taking any of this for granted. If you have the Periscop app Crystal is often on there talking to us and answering questions. THANK YOU for this post. My mom was visiting this weekend. My parents investments are now worth several million dollars, mostly because they scrimped and saved every (and I mean every) penny. We never took a family vacation, they have never upgraded their house or anything in it…and my mom regrets it. She would rather have more memories of fun (or at least less stressed) family togetherness than the estate they now have to figure out what to do with. This is a great comment. A dear friend of mine growing up had parents very similar to how you’ve described yours. They aren’t millionaires but they are doing well now. Now that their kids are in their late 30s and early 40s. They help their kids a lot now by buying for the grandkids, etc. but I don’t think that can ever make up for the first 20 years of not being around much because of business commitments, not taking vacations, scrimping on every little thing. I can tell you my friend, while frugal, has chosen to do things differently because of that. Thank you so much for this comment! My husband and I just finalized on an offer for a new house. We looked for over a year and had a very low number in mind. When we found the perfect house 5 minutes from my son’s school we debated spending the money ( it was about $50,000 more than we wanted to spend) even though after being frugal for many years we could easily afford it. Our old house is very small and has never been updated. It still has the original 60’s kitchen and bathroom. I never let my older boys bring their friends over. I regret that. Now they can all have friends over and we are looking forward to creating fun memories with them. Thanks again!! I realize this comment was made 2 years ago, but it popped up at the perfect time for me. Thank you for sharing. I love this post. It’s so important to think about how we allocate our money and how we allow splurges on areas that are of high value to our specific families. Every family’s splurges will be different based on their values and their current life situation. In our family we “splurge” on Catholic school for our kids. A high-quality faith-based education is a priority for us. We also allow for a higher grocery budget in order to eat healthy (not entirely organic, but healthy). We buy a lot of fresh produce, nuts, organic dairy products, high quality meats, etc. Investing in our health will save us money on healthcare in the long run and improve our quality of life now. We also love to travel and share “adventures” with our kids as we have the money. It’s not exotic at this point in our lives, but every adventure, no matter how far or near is a learning experience and a memory making opportunity for all of us. And finally, after fighting it for a while (like you, Crystal), I am finally allowing us to get a housekeeper (after my husband pleading for one for a long time). We can afford it right now and it will save us a lot of time and anxiety on the weekends. If my husband’s income changes (and it does fluctuate), we will re-evaluate later. Right now we are splurging on buying organic foods, dental insurance for my husband . He didn’t want to pay extra but I think teeth are so important !!! We are also splurging on better non toxic products . Right now we are splurging on stuff for the baby. Wife is due in 2 weeks – its down to the wire. A cleaning service is something we have looked into as well…we really do spend a ton of time cleaning. Right now, we’re trying to get our small credit card debt paid down and set aside funds for inevitable hospital bills, since we’re having a baby in about 3 months. But so far in our marriage, the main things we’ve splurged on has been travel and cable. We took a trip to France last fall, and even though that’s where most of the debt originated, we both agree that the experience was worth it. The cable has actually been a good investment for us right now, too–I’ve been nauseous for this entire pregnancy, and the first several months in particular were so bad that pretty much the only thing we could do to spend time together was watch tv! My husband is also a huge hockey fan, and not of our most local team, so we haven’t found a good alternative to the hockey package that allows him to enjoy watching his favorite 2 teams. We’re talking about dropping cable for the summer to save a little money, but that will probably still be a splurge for us in the future. That, and the occasional fabric/craft supplies for me! Love this post! We “splurge” on faith-based schooling for our daughter, sports for her, a gardener vs a house cleaner, milkman delivery to my porch of local dairy goods, organic fruits and veggies from a local farmer, since my hubby wears a strict uniform every day he likes one pair of nice sneakers, I have one favorite clear lipgloss I rock and we travel like you on deals, but make it happen. All this while we invest 100% of my income from my 30hr/week job while our daughter is in school and over half of my hubby’s income too. We lived lean for years to have some breathing room now. Sometimes the return on a splurge is more than you can quantify. For example, I hate mowing the lawn. I mean, I *really* hate it. Just thinking about having to do it sends my blood pressure on an upward swing and anxiety grips my belly. So, spending to have my lawns mowed is very cheap stress relief therapy. Plus, my lawn guy gets the job done in a third of the time it takes me! I have a few “splurges.” I have a gym membership ($36/month) and religiously go (5-6 times/week). I also look at it as an investment because I’m trying to take care of myself so I can take care of my kids (single mom). They also have childcare included so it’s worth it! This past year, I told myself that I would try to take care of myself so I try to get a massage every month. They have a deal at the local hospital when you buy a massage every 25th of the month, they take 20% off so it costs about $37 for an hour massage. It’s worth it to me and that’s one of the only things that really relaxes me! It’s so heavenly. Also, I use the child support money I get to allow my daughter to continue going to the Christian school she has gone to since she was in preschool (we also get some kind of aid to go). She also takes piano lessons. I look at it all as investments whether it’s time or in people! 🙂 Thanks so much for this post! I just love this post. It helps others to understand the balance that goes along with living a budgeted lifestyle. We have chosen to invest in Private school education for our daughters. Education is important in our household but a Christ centered one is number one. After much struggle I am reallocating some funds and increasing our grocery budget to invest in our health. Higher food quality as well as the products we use will have lasting health benefits. Thanks for this great post. I have read your blog for several years now. Your story is such a testimony of good stewardship. It has motivated many to make small changes that can lead to huge benefits. It has also motivated me personally to live with an eternal perspective. The advice, time, money-saving tips and help that you have given to your readers far exceeds the profits you have made on this blog. Your servant’s heart and kind responses to even your critics continues to point others toward the Savior. P.S. I hire a cleaning person several times a year to do the deep cleaning stuff as well. I have small children, the cost is minimal, and it is such a relief to me to be able to spend that time doing important things for my family and not have to worry that I'm letting our home go. It is a huge positive for us as well! Good info. Do you still have a cleaning lady? Any comments or post on that in the new house? Season of life? I am looking into it. Right now our splurge is my staying home with the kids and homeschooling them. That experience is going to have to do it for my kids, as our budget is very tight. If I had a wish, it would be the ability to visit my parents and grandparents at least once a year, since kids grow so fast.